Did you know that Jean Baptiste Pointe du Sable founded what was to become Chicago? That Charles Richard Drew invented a method of preserving plasma for blood transfusions? Or that Phyllis Wheatley wrote a poem about George Washington, and as a result was invited to meet him? These are only three of the twenty black men and women you will learn about in Famous Firsts of Black Americans. This historical overview, geared to elementary and junior high school students, focuses on notable black people who made unusual and important contributions, and helped shape the destiny of America. Arranged chronologically, the brief biographies include those who made significant contributions in the fields of science, politics, sports, and the arts-from Estevanico Dorentez, an early Spanish explorer, to Jackie Robinson, the first black man to play major league baseball. Also included are: Crispus Attucks, Benjamin Banneker, Richard Allen, York, Jan Matzelinger, Bill Pickett, George Washington Carver, Matthew Henson, Charles Henry Turner, W. C. Handy, Jack Johnson, Hugh Mulzac, Frederick McKinley Jones, Ralph Bunche, and Marian Anderson. 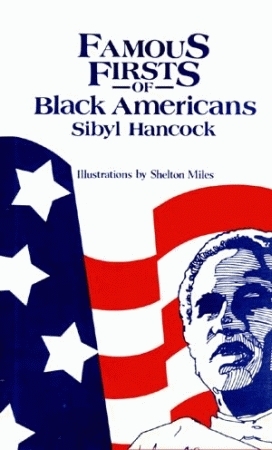 Sibyl Hancock is the author of fourteen previous books, including Old Blue, which was an ALA Notable Book in 1980 and was on the master list of the Texas Bluebonnet Award and the Washington State Children’s Choice Picture Book Award.